OFFERING PARTNERSHIP TO UTILIZE FLY ASH AND BOTTOM ASH "FABA" FROM COAL POWER GENERATION PLANTS. Coal feed stock is supplied Sumatera and Kalimantan. 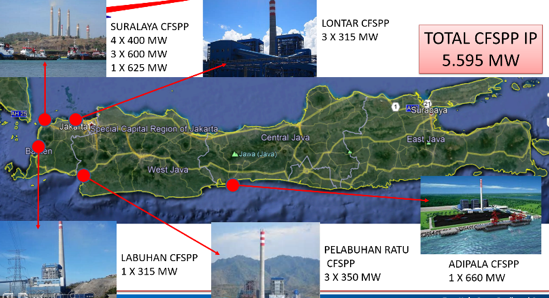 The top four coal supplier for IP’ power plants are Bukit Asam, Adaro, Berau Coal and Kideco. Indicative ash content is about 2 – 4 %. In managing fly ash and bottom ash from power plants, PT. IP is cooperating with cement industries to utilize fly ash. The others utilization of fly ash are for brick building material, and others concrete materials. Therefore, due to continuous production of fly ash and bottom ash from power plants, the utilization of fly ash and bottom ash, still leave piles of ash that dump in to ash valley. PT. IP is seeking partnership to utilize fly ash and bottom ash produced by IP’s power plants. PT. IP is welcoming to potential applied new technology to convert the bottom ash and fly ash into more valuable material. The basis of business partnership is mutually benefitted with the parties. Any legal permits and others compliance issues that may arise to proceed the business partnership according to the regulation from Government of Indonesia will be discussed together after signing MOU or NDA. We are expecting to utilize fly ash & bottom ash into two steps, step 1 is for Suralaya Coal Fired Power Plant only, which has been operating since 1984. This is more timely crucial to manage the accumulation of fly ash and bottom ash, that now stored in their stock pile. Bottom ash pile now is approximately 5 MIO tones.